Test your OWASP knowledge and earn credit. Well, currently, there are no certification exams and no formal training available so how do you prove it? We decided to compile a short 10 question quiz that will allow anyone to learn about the OWASP Top 10 and test their knowledge after each brief segment. If you need credit, save your results. You will need to create a free account to access the training material. We offer this resource freely to everyone. We do ask you to check out our other Proactive Cyber Security services too. The OWASP Top 10 defines and describes the most common and severe web application threats that developers face. We have also included bonus sections which go beyond the current OWASP Top 10. As a developer, you need to understand these threats and take precautionary measures at every stage of product development to mitigate them. Explain the key security principles related to the OWASP top 10 and Bonus Course-ware. Identify and explain the ten threats in the OWASP Top 10 and Bonus Course-ware. Explain mitigation techniques for the 10 identified threats and Bonus Course-ware. Let’s look at three key security principles related to the OWASP Top 10 threats. During this course, you will learn about the concepts associated with each of the Top 10 threats and Bonus Course-ware. Additionally, you will learn about the techniques that you can use to mitigate each threat. Much of security is related to input and a user’s ability to interact with and control that input. You should always mistrust and question user input everywhere that it is accepted in your application. Always remember that any input you receive could be malicious and you need to validate it before you trust it. Time of Check versus Time of Use, or TOCTOU describes the temporality of computing. Although it is convenient to think of a computer program as a series of instructions, starting at a method and going sequentially until it reaches its completion, remember that this interpretation is only an abstraction. Even though you might check input, state, or data at one point in time, an attacker may be able to control some aspect of the program between the time that the resource is checked and the time that the resource is used, which can lead to illegitimate access to the resource. Finally, remember that the world is constantly changing and chaotic, with new threats developing and manifesting every single day. A system that was secure in the past may not be secure against new threats. You need to have a consistent and reproducible plan to handle evolving threats. A web application faces a number of threats online. Security misconfiguration can lead to vulnerabilities in a Web application and help a malicious user to leverage them. You need to follow good operational practices to mitigate the threats caused by security misconfiguration. Use a repeatable hardening process to implement precautionary measures to mitigate security misconfiguration threats. Get current information and advice from the OWASP community. Get the latest in security news and awareness from the Lazarus Alliance Cybervisors as well as daily industry breach reports from the experts in Proactive Cyber Security. We recommend you keep a copy of your results for your personal training records and continuing educational credit purposes. Additionally, your company audit, compliance, security or human resource department may require it so please forward a copy to them as well. This concludes the OWASP Top 10 Threats and Mitigation with Bonus course. Please click the Exit Course button, or close this browser window to finish the course. Thank you for participating and helping to improve security awareness. If Lazarus Alliance may ever be of service to you for audit & compliance, risk assessment & management, governance & policies, vulnerability & penetration testing or our Cybervisor® services, please let us know. You can use the defense in depth strategy to mitigate injection. By limiting permissions and rights to the absolute minimum required to perform tasks, you can limit the damage that occurs if an attacker does manage to compromise an application—the attacker is limited by the rights of that application. This expression results in the instructions, or the set of code that should be executed. Consider the first value when the input is 12. The program takes the value of x, adds 12 to it, and stores the result as the new value of x. Now, consider the second input. Because you are assembling the code and data together into a single string, the parser has no way to determine the difference between data and code. The program considers the value of the string and determines that two expressions were actually intended, one to increment x and another to print the value foo. At this point, the malicious user has identified a vulnerable part of the application and can execute code under the context of the parser or interpreter. The difference between an established language like LDAP, and a custom interpreter written to allow grouping of where clauses in SQL, is very small in the eyes of a malicious user. If a language has a parser or an interpreter, and if the input can be confused for instructions in the language or the way the language is applied, then the language is vulnerable to an injection attack. All languages use some kind of control construct to express the meaning of phrases. Even in languages that are syntax free, the code is in the words themselves. In most practical languages; however, control codes are used predominantly or exclusively. Let’s look at a few commonly used control constructs. Injection uses specially crafted input that invokes these semantic control codes. When a malicious user can manipulate, influence, or control these semantic codes, then they can manipulate the meaning of a program to a parser or interpreter. Now, you will look at an example of SQL injection. 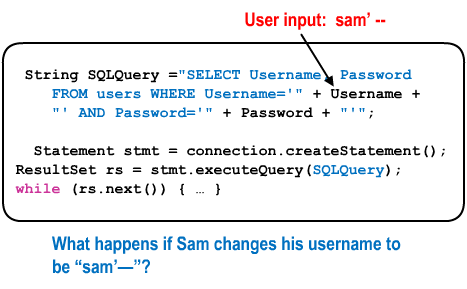 Authenticating a user against a database is a common programming practice. However, by modifying the username, you can perform an SQL injection attack. The discussion on injection illuminates one of the most important concepts related to the OWASP Top 10: All input should be considered evil. Almost every attack begins with user input; any input you receive could be evil and you need to validate it before you trust the input. You can use a number of techniques, at the code and architecture level, to make your software more secure; however, these techniques will not protect you all the time. Even when used in conjunction with other techniques, these techniques may not be able to prevent all malicious input. Be sure to use defense-in-depth, redundant layers of defense, in order to reduce your risk as much as possible. When developing, always consider “What have I done to prove that a malicious input will be unsuccessful?” Wherever possible, use available product APIs to manage persistence because generally speaking, they will have already tested and hardened the code. Click each tab to learn about the techniques to prevent malicious input. The block and allow lists help you to strictly define what valid input looks like. Use a whitelist wherever possible; use blacklists only as a secondary defense. Use escaping whenever user input may be echoed back to the user in HTML or any other form where it may be interpreted as script. If you have a GET parameter, and you are going to convert it into a 32-bit signed integer, you first validate that the input is made up of 1 to 12 digits optionally preceded by a hyphen (-). This is the only valid input that could signify an integer; all other input can simply be an error state. A block list provides a list of disallowed input. If you are trying to protect against regular expression injection, you might choose to disallow the pound (#) character so that a malicious user could not comment out a line. If you chose a reasonable set of control characters from your parser or interpreter language, you can increase your defense against malicious input. You can also use the escaping technique to provide extra metadata to the interpreter to tell it that the input is data and not code. You could encode all pound (#) characters with a preceding back slash (\) to tell the parser that the following character is a literal and not a control character. You can also notate the difference between code and data. 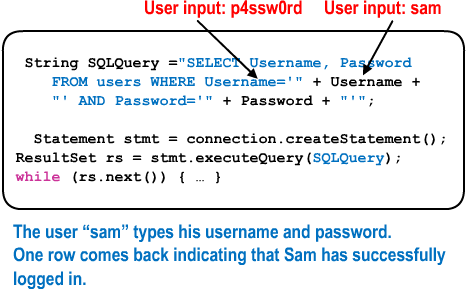 For SQL injection, this is the single most effective way to prevent injection attacks. 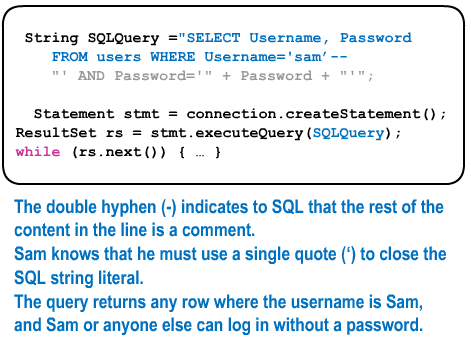 SQL allows you to specify input at a completely different point than the instructions (code) that it is to execute. In this way, the parser can unambiguously determine the difference between code and data. Even using this technique, there are specific circumstances where a malicious user could still get input injected into code; however, it is that much more difficult and in many cases impossible. Instead of taking arbitrary user input when providing the user a set of choices, you can encode the choices into a table and provide the pointers or indexes in that table. This way, the user can manipulate only the pointer or index to the table, resulting in a selection that is always valid-the value exists in the table, or the index or pointer is invalid. You can use the following architecture-level techniques to prevent attacks based on malicious input. Which of the following techniques can be used to protect against injection attacks? Let’s look at the next threat―broken authentication and session management. Broken authentication is caused by poorly implemented custom code or misconfigured off-the-shelf code. The HTTP protocol does not support authentication and session management; so many developers create a custom implementation to work with HTTP. Frequently, these implementations are written without a complete understanding of their complexity. Before creating a custom implementation, determine if a suitable framework component already exists, or if a small extension to an existing component would satisfy the requirement. If you do need to write custom code, make sure that you understand the threat environment inherent in an authentication and session system. Review the requirements and ensure that each is met, and review common problems to avoid common mistakes. When implementing an authentication or session system, review the following requirements. Click each requirement to learn more about its explanation. Credentials are always protected: An authentication system will usually need to pass some secret over the network. If you are passing secrets or credentials over the network, they must be protected by encryption or hashed with a salt. Strong passwords are required: The password complexity requirements depend on the data being stored. Consider a password that is at least eight characters long, and requires upper and lowercase letters, numbers, and punctuation. Consider using a pass-phrase instead of a password and support the following pass-phrase formats. Multiple words combined 32 to 96 characters long. Session IDs are not exposed in URL: After a user has been authenticated, a session ID or authentication token is given to the user. The user sends this token to the server in every request to indicate to the server that he has already been authenticated. In effect, the token is a replacement for the original authentication credentials. The token must not be exposed to theft, because taking the session ID allows an attacker to hijack the user’s session. Session IDs are newly created during authentication, preventing session fixation attacks: New session ID should be created for each login to prevent session fixation attacks. In a session fixation attack, a malicious user can usurp the session ID of a victim and take over his session. 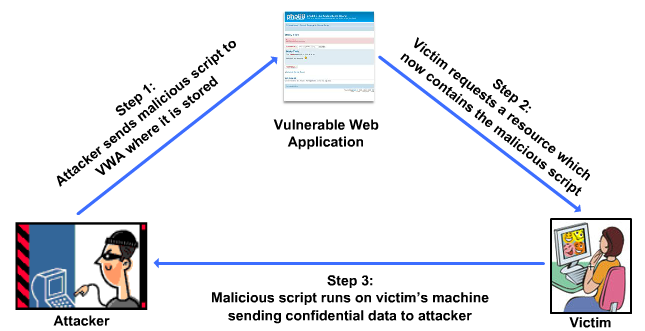 In this attack, the victim is tricked into logging into the web site, but instead of getting a new session ID, the victim uses the attacker-provided session ID. Session IDs must be cryptographically random: Session IDs should be cryptographically random to prevent malicious users from guessing the session IDs. Session IDs are only accepted from cookies: Session IDs should only be accepted from cookies. Other locations can increase the risk of a vulnerability. For instance if you place session ID in the URL you can expose the IDs to a third party. If you place the session ID in form variables then they can be at risk of being manipulated by a malicious user. Log the user out after a period of inactivity: The session management system should include functionality to log users out after a period of inactivity. The logout functionality should invalidate the authentication token and require the user to log in again. 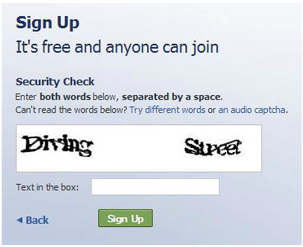 Use CAPTCHA to prevent automated attacks: A CAPTCHA distinguishes a real person from automated software. It is a test that is reasonably simple for a human to complete but difficult for a computer. Consider a CAPTCHA system to protect your authentication systems from automated attacks. When implementing an authentication and session system, you should also consider the location of the storage of the session state. The client needs to store the session state to indicate to the server the authenticity of the client. Without this capability, the client would be forced to re-authenticate for each new request. This page details some of the weak choices that can be made for the storage of the client state: URLs, persistent cookies, and form variables. The best place to store the session ID is in a nonpersistent cookie that has the httpOnly flag set and the secure flag set. Click each tab to learn more about the weak choices for the storage of the session state. URL: You can easily share a URL with others, and you can easily copy and paste a URL into an e-mail message or chat session. URL is also sent to third parties automatically in the form of the referrer header. Whenever the browser agent transitions from one Web site to another, it tells the new site where it is coming from, including any session ID that is stored in the URL. Persistent Cookies: A persistent cookie is available to the browser even if you shut down the machine, reboot, and come back to a Web site. In that intervening time, some other person could have used the machine, or the cookie might have been stolen. Instead, use nonpersistent cookies. The browser automatically deletes a nonpersistent cookie when the browser is closed. From an engineering perspective, systems based on using form variables are usually limited because many Web interactions do not use a form to interact with the server. A session-based system identifies a user returning to a Web site for personalization and identification and authenticates a new or returning user to the Web site to provide access to restricted resources. Although it is tempting to use a single cookie for both purposes, subtle differences make authentication and identification mutually exclusive. It is a replacement for a user’s credentials. It allows access to restricted parts of the Web site. It should always use a non-persistent cookie because the cookie should be deleted when the user closes the browser. As an optimization for highly scalable Web sites, a completely random session ID can be replaced with an encrypted token of the user’s ID in the system along with a timestamp. This way, the session ID does not have to be “remembered” by the server and can be shared with any server that has the correct decryption key. 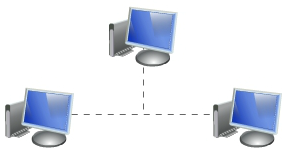 This technique allows a highly scalable Web application to be split across many servers. 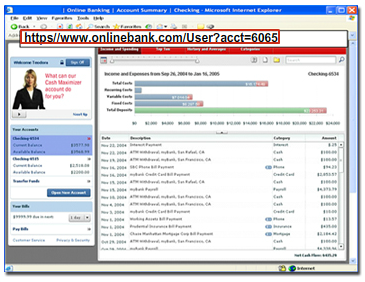 It is not strictly necessary and it identifies returning users to the site. As such, it must use a persistent cookie so that it is not deleted when the user closes the browser. It should be public information; if stolen or changed, it should not cause significant concern. It is not a replacement for the credentials and should not allow access to restricted resources of a Web site. Which of the following are authentication systems mandatory requirements? The first thing you have to determine is which data is sensitive enough to require extra protection. For example, passwords, credit card numbers, health records, and personal information should be protected. Which of the following responses apply to sensitive data exposure attacks? All salted hashes can be exposed with a rainbow table of precalculated hashes. By default, many older XML processors allow specification of an external entity, a URI that is dereferenced and evaluated during XML processing. SAST tools can discover this issue by inspecting dependencies and configuration. DAST tools require additional manual steps to detect and exploit this issue. Manual testers need to be trained in how to test for XXE, as it not commonly tested as of 2017. These flaws can be used to extract data, execute a remote request from the server, scan internal systems, perform a denial-of-service attack, as well as execute other attacks.The business impact depends on the protection needs of all affected application and data. Any of the XML processors in the application or SOAP based web services has document type definitions (DTDs) enabled. As the exact mechanism for disabling DTD processing varies by processor, it is good practice to consult a reference such as the OWASP Cheat Sheet ‘XXE Prevention’. Disable XML external entity and DTD processing in all XML parsers in the application, as per the OWASP Cheat Sheet ‘XXE Prevention’. Implement positive (“whitelisting”) server-side input validation, filtering, or sanitization to prevent hostile data within XML documents, headers, or nodes. SAST tools can help detect XXE in source code, although manual code review is the best alternative in large, complex applications with many integrations. If these controls are not possible, consider using virtual patching, API security gateways, or Web Application Firewalls (WAFs) to detect, monitor, and block XXE attacks. Numerous public XXE issues have been discovered, including attacking embedded devices. XXE occurs in a lot of unexpected places, including deeply nested dependencies. Using extremely complex data formats such as XML, JBOZ and avoiding serialization of sensitive data is very effective against XXE attacks. Patching or upgrade all XML processors and libraries regularly is one of the best defenses against XXE attacks. Validating inbound XML or XSL file upload functionality is a good strategy for thwarting XXE attacks. Implementing positive ("blacklisting") server-side input validation, filtering, or sanitization prevents hostile data within XML documents, headers, or nodes. Insecure direct object references occur when an application does not validate that the client has access to a resource pointed by a reference. This frequently happens when the application sends the client a set of links to URLs that have references directly to the objects, such as a database row. A malicious user manipulates the reference to access other, restricted URLs, and the data pointed by these URLs may be available to the malicious user. Additionally, depending on the functionality of the URL, a malicious user can access the data to modify and tamper it or elevate privileges. And, predictable IDs might lead to complete disclosure. For example, identity columns in a database are completely predictable, and a malicious user can easily determine all of the IDs in the system. Like injection and XSS, evil input is the root cause of this threat. Always validate input before trusting it. Here is an example to help you understand insecure direct object references. In the end, you will notice that while clicking the actual URL and rendering the account page, there is no authorization check and no check at time of use. 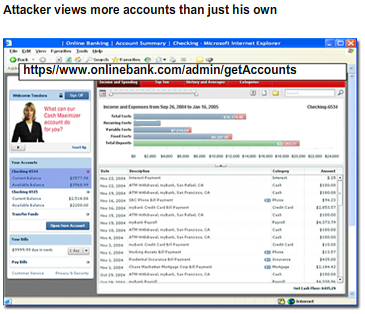 As a result, the malicious user realizes that the URL provides access to all of the accounts in the system. This vulnerability is especially critical in avoiding injection attacks so please refer to that section for more information. In any case that you are taking an object ID from a user, you must verify that the user has rights to that object. Time of Check Time of Use vulnerabilities occur any time a resource is validated and then a malicious user is able to alter the reference before the resource is used. Usually this occurs because an authorization check is performed on one page and the use of the resource is on a different page. In between these two points, a malicious user can change the reference to point to a resource for which he or she is not actually authorized. A user has permission to download five images and they are asked to select one. If you give them five links to the pictures directly, they might be able to guess that they can access additional pictures that they shouldn’t have access to just by changing the URL to reference a different picture. Instead, you can put the five links in a table so that the table has the direct links and the user just selects the appropriate index. When the user selects one of the five valid indexes you retrieve the corresponding URL from the table and return the image to the user. Which of the following are the results of insecure direct object references? Using a proxy, browse your application with a privileged role. Then revisit restricted pages using a less privileged role. If the server responses are alike, you’re probably vulnerable. Some testing proxies directly support this type of analysis. Scenario #1: The attacker simply force browses to target URLs. The following URLs require authentication. Admin rights are also required for access to theadmin_getappInfo page. Scenario #2: A page provides an ‘action’ parameter to specify the function being invoked, and different actions require different roles. If these roles aren’t enforced, that’s a flaw. Hard coded program entitlements help to prevent function level access control attacks by eliminating transitional programming mistakes. Think about the process for managing entitlements and ensure you can update and audit easily. After you deploy your Web application online, it undoubtedly will encounter a number of attacks. To prevent these attacks from being successful, you need to follow sound operational practices related to security. Inadequate operational practices can lead to exploits of security features or of known vulnerabilities. Improper permissions may allow malicious users to perform actions that they shouldn’t. Missing patches: Patches, hotfixes, service packs, and updates contain the latest security fixes and need to be applied when they are available. Misconfigured or disabled security features: If a security feature is disabled or not configured, it cannot provide protection. 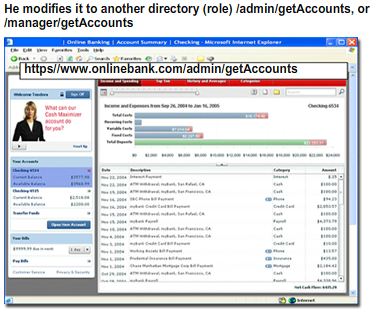 Default accounts: Default accounts may allow a malicious user to automatically login with the credentials published in product documentation. Unnecessary/unused services or features: These represent an increased risk for security defects. Bugs exist even in the best-written code, By disabling unused and unnecessary services, code, and DLLs, you limit the amount of code that needs to be maintained and patched. When in doubt, turn features off, and turns them back on only if you need them. (Not recommended for production systems). Administrative back doors: Administrative back doors are known as front doors in the hacking community. It’s absolutely critical to secure these administrative endpoints for what they are: the keys to the kingdom. Do not rely on a malicious user overlooking the functionality; it can always be discovered. Security through obscurity is no security at all. Updating the environment: This includes changes like adding or removing network segments, and changing configuration. New products: New products or functionality may be needed to deal with a threat that did not exist when the application was released. New service pack or patches: Use a regular process to apply the latest service packs, patches, hotfixes, and updates to all of your software, from top to bottom. In addition, your development, test, and staging environments should precisely match the production environment. If your environments don’t match, you might discover on release day that your application doesn’t work as expected. Consider the following real-world scenario we encountered with a customer. The team was working on an application using NTLM authentication, and they were developing a major revision to the application. None of the developers were actually using NTLM during development because they were not members of the domain. They considered setting up a matching domain but didn’t want to administer it, and it seemed like a trivial detail. Two weeks before the application was released, the program manager realized that no one has tested the application with NTLM, but decided he wasn’t concerned because he felt NTLM wouldn’t cause them any problems. However, during testing, one of the testers discovered that the database connection pooling incorporated in the new version didn’t work with NTLM. There was no time to fix the software, so they had to change the production environment instead, causing a lot of last-minute work and significant risk. If your development, test, and staging environments don’t match, you might discover too late that your application doesn’t work correctly because some vital pieces are missing. A well-defined process provides your first line of protection against a dynamic threat environment. A regular, repeatable hardening process is required to make sure your environment is protected against the latest threats. Which of the following are involved in the hardening process? XSS attacks are categorized by the source of the malicious input―sometimes input is from the server, sometimes from the client. For all XSS attacks, the vulnerability results because some data (input) is interpreted to be instructions (code) by the browser. In all XSS attacks, this execution of code is performed in the context of the vulnerable server. Click each tab to learn more about the types of XSS. A reflected attack occurs when a client sends malicious input to a server, and the malicious input is returned back to the client. The client executes code in the context of the current user. 2. The server echoes malicious input back to client. 3. The victim browser considers this script as coming from server. Consider a link for a programming book, as shown in the adjacent image. Would you click on a picture of a book that you wanted? However, instead of an actual link to the book on Amazon, you get the message shown in the image. Your browser takes you to Amazon.com, but with code that the malicious user has supplied as input to the GET parameter “book”. If code executes on this site, the browser (and the victim) assumes that it has come from Amazon and not the site with the malicious book link. The malicious code could send the victim’s Amazon authentication cookie to the attacker, which would allow the attacker use the victim’s credit card. For additional examples, please refer to the links on the last page of this course. A persistent attack occurs when a client sends malicious input to a server, and the malicious input is stored at the server. Later, the input is returned to another client and the data is executed as code in the context of the current user. 1. The attacker submits input to the server. 2. The server stores the data. 3. The server later returns data to different clients. 4. Stored data is executed by the client as if it is coming from the server. Consider a forum on a technical support web site. The forum takes input and stores it into a database. Let’s say the input is actually from a malicious user. When a victim browses that forum, the server retrieves the data from the database and renders it back to the victim. Because of vulnerability in the way the server renders the content into the browser, the malicious input is actually executed by the victim’s browser. The execution is in the context of the vulnerable web site, not the malicious user. This attack is similar to a reflected attack, except that at the code layer, the variable that has the malicious data does not come from the request. Instead it comes from the internal database that houses the state for the application. Malicious data can come from many places, such as the network, a database, a file, or a registry key. Malicious data can even get into the resource section of a binary loaded into your application. A DOM-based attack occurs when malicious input is never read from the server but is instead sent by the malicious user from some previous state in the browser. The malicious input in this case is not attacking vulnerability on the server but the vulnerable client-side code instead. In DOM-based XSS attacks, the client has code that is vulnerable to the attack. In this type of attack, the malicious input does not pass from the server to the client in any form, but instead passes from the client in one site context to a client in another site context. Consider Web site code that prints the URL of the referrer page on the screen. An unsophisticated implementation would simply get the value from the referrer and write it to the web page. However, if the referrer location contained an embedded script block, the script would be written and executed as if it were actual code. Just because the code is already running on the client doesn’t mean that you are safe―even client code can be vulnerable to XSS attacks. Let’s look at a few potential sources of input that a malicious user can control, and mitigation techniques that you can use to prevent malicious input. Allow list – Regex or list lookup. Escaping – Consider a trusted library for this functionality. You can also use defense-in-depth by enabling extra flags on cookies. The HttpOnly flag indicates that the cookie should not be available to the client script. Secure cookies indicate that the cookie holds sensitive data and should be sent only over an encrypted channel. Match the XSS types with their corresponding explanations. Exploitation of deserialization is somewhat difficult, as off the shelf exploits rarely work without changes or tweaks to the underlying exploit code. This issue is included in the Top 10 based on an industry survey and not on quantifiable data. Some tools can discover deserialization flaws, but human assistance is frequently needed to validate the problem. It is expected that prevalence data for deserialization flaws will increase as tooling is developed to help identify and address it. The impact of deserialization flaws cannot be understated. These flaws can lead to remote code execution attacks, one of the most serious attacks possible. The business impact depends on the protection needs of the application and data. Object and data structure related attacks where the attacker modifies application logic or achieves arbitrary remote code execution if there are classes available to the application that can change behavior during or after deserialization. Typical data tampering attacks, such as access-control-related attacks, where existing data structures are used but the content is changed. that only permit primitive data types. so reliance solely on this is not advisable. connectivity from containers or servers that deserialize. Scenario #1: A React application calls a set of Spring Boot microservices. Being functional programmers, they tried to ensure that their code is immutable. The solution they came up with is serializing user state and passing it back and forth with each request. An attacker notices the “R00” Java object signature, and uses the Java Serial Killer tool to gain remote code execution on the application server. Complete enforcement of strict type constraints during deserialization before object creation as the code typically expects a definable set of classes is not advisable. Isolating and running code that deserializes in low privilege environments is a preferred strategy for insecure deserialization attacks. In theory, it ought to be easy to figure out if you are currently using any vulnerable components or libraries. Unfortunately, vulnerability reports for commercial or open source software do not always specify exactly which versions of a component are vulnerable in a standard, searchable way. Further, not all libraries use an understandable version numbering system. Worst of all, not all vulnerabilities are reported to a central clearinghouse that is easy to search, although sites like CVE and NVD are becoming easier to search. Determining if you are vulnerable requires searching these databases, as well as keeping abreast of project mailing lists and announcements for anything that might be a vulnerability. If one of your components does have a vulnerability, you should carefully evaluate whether you are actually vulnerable by checking to see if your code uses the part of the component with the vulnerability and whether the flaw could result in an impact you care about. Component vulnerabilities can cause almost any type of risk imaginable, ranging from the trivial to sophisticated malware designed to target a specific organization. Components almost always run with the full privilege of the application, so flaws in any component can be serious, The following two vulnerable components were downloaded 22m times and counting. Spring Remote Code Execution – Abuse of the Expression Language implementation in Spring allowed attackers to execute arbitrary code, effectively taking over the server. Every application using either of these vulnerable libraries is vulnerable to attack as both of these components are directly accessible by application users. Other vulnerable libraries, used deeper in an application, may be harder to exploit. One option is not to use components that you didn’t write. But that’s not very realistic. Emergency software patching may be implemented without testing with management authorization only. Patching software addressing security vulnerabilities within 95 days is required by PCI DSS, SSAE 16, FedRAMP, ISO 27001 and NIST 800-53 as a best practice. Exploitation of insufficient logging and monitoring is the bedrock of nearly every major incident. Attackers rely on the lack of monitoring and timely response to achieve their goals without being detected. One strategy for determining if you have sufficient monitoring is to examine the logs following penetration testing. The testers’ actions should be recorded sufficiently to understand what damages they may have inflicted. Most successful attacks start with vulnerability probing. Allowing such probes to continue can raise the likelihood of successful exploit to nearly 100%. In 2016, identifying a breach took an average of 191 days – plenty of time for damage to be inflicted. You are vulnerable to information leakage if you make logging and alerting events visible to a user or an attacker. Ensure high-value transactions have an audit trail with confidentiality controls to prevent tampering or deletion, such as append-only database tables or similar. Establish or adopt a NIST 800-61 rev 2 or later compliant incident response and recovery plan or similar plans from Lazarus Alliance. Unvalidated forwards can allow a malicious user to spoof your site. The malicious user provides the victim with what looks like a link to your site but actually redirects the victim to a malicious location. Many authentication systems use redirection to return a requester to an authorized URL after login, so the user may not notice that the site is incorrect. To protect an application against unvalidated redirects and forwards, you need to validate the input as well as the referrer header, which can be controlled or manipulated by a malicious user. Complete spoof of your site. A phishing attack could redirect the client to a malicious Web site. A malicious user can also use redirects in combination with a CSRF attack. For example, if the vulnerable action checks the referrer to validate that it comes from your vulnerable site, the unvalidated forward makes the mitigation insufficient. Bypassed authorization checks. In most common Web platforms, an API call exists that directly transfers a client to another location, bypassing authorization checks. If such an API is used to implement an unvalidated redirector, a malicious user simply needs to use the redirect as the entry point to all other resources on the site. 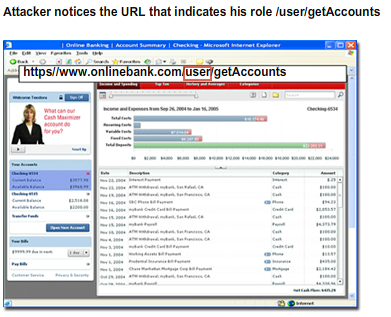 Never use internal transfer without authorizing the user for the target URL. In general, it is far easier to use a redirect method, which will issue a 302 response to the client and ask the client to make another request for the target URL. At that point, it will be like any other request for the target. Wherever possible, restrict the usage of your forward functionality to some set of authorized users, instead of all unauthorized users. Use weblogs to identify potential code. Look for HTTP status codes in the 300 series: 301, 302, 303, and 307. Where possible, use redirect, or redirect to static locations. When redirecting to a parameter, validate the parameter to make sure that it is an expected redirect. Use table indirection where possible to turn a dynamic set of potential choices into a table of valid keys. At the very least, allow only relative redirects. If you have a potential set of valid locations that the client is allowed to redirect to, consider using table indirection. Maintain a table of allowed URIs, and then allow the client to specify the keys into the table only and not the actual URI itself. When the key is returned, look up the URI in the table and then redirect to that location. In the following URL, the color blue indicates user input, and the color grey is the unencoded value of the redirect parameter. Even if your system requires additional data to be sent to the location, the table indirection can still be successful. Simply take the additional parameter and combine it with the URI value from the table. Be careful of any type of injection attack here; even though you are restricting the malicious user, you still need to validate the data in “param1”. Sort the techniques based on the threats. Which of the following may be included in the Insufficient transport layer protection category? Sort the techniques based on the threats. Which of the following may be included in the Unvalidated redirects and forwards category? The most common error regarding cryptography is the failure to use it. Most people significantly underestimate the value of their data and the cost of a data loss. Insecure cryptographic storage is the misapplication or missing application of cryptography to a software system. The level of effort you use to protect your data depends on its sensitivity. Sensitive Information includes personal information, such as health records, social security numbers, and financial data, including credit card numbers. You can even consider order history or date of birth as sensitive. The other type of sensitive information is security information. Usually, this information is tied to an authentication or session management system. This information enables an individual to act as a specific principal on a system; anyone who can access this information can be that principal, so it needs to be well guarded. To use cryptography effectively, you need to be aware of six fundamental principles. Click each tab to learn more about these principles. Randomness: Random numbers play an extremely important part in many aspects of cryptography. Many implementations of pseudo-random number generators (PRNG or RNG) are unacceptable for use in cryptography because they generate predictable number sequences. Given an element from a sequence, if you can determine with a high probability or with certainty the next number in a sequence of random numbers, then the PRNG cannot be used within the domain of cryptography. Rand, Rnd, and Random functions use a predictable sequence of numbers, provided by Linear Congruential Generator (LCG). Most cryptography APIs provide their own random number generator, which produce cryptographically random sequences of numbers, though at a higher cost than an LCG. When using random numbers with cryptography, be certain that they are random enough. Encryption: Encryption is a method of converting plain text into cipher text with the use of a key. The plain text should not be retrievable from the cipher text without knowing the value of the key. Decryption is the reverse process of turning the cipher text back into plain text. Encryption algorithms come in many forms. Symmetric algorithms use the same key value for both encryption and decryption, while asymmetric algorithms use different keys for encryption and decryption. Asymmetric algorithms are at the basis of key exchange protocols and public key cryptography. Another fundamental difference between different encryption algorithms is defined by the data the algorithm is used on. Stream ciphers are used for data in transit and are often implemented for network applications. Block ciphers operate on fixed-sized blocks of data at rest, although block ciphers can be used in ways to simulate a stream cipher. Never use custom algorithms; they are unlikely to be secure or well-designed. Creating real cryptographic algorithms requires significant knowledge of advanced mathematics. Don’t create your own algorithm unless you have an advanced degree in mathematics and are publishing your algorithm for peer review. Hash: A hash is a one-way function that, given an input value, returns a fixed-bit output value; it is common to many computing applications. In a cryptographic hash, it is computationally infeasible to determine anything about the input of a cryptographic hash based on the computed output hash value. Cryptographic hashes are useful for protecting values for which the original input is unimportant. Hashes also play an important role in other cryptographic applications like keyed hashes, block encryption, and signatures. A standard hash is subject to an offline attack, most often characterized by the use of a rainbow table. A malicious user can precompute potential hash values and store them before attempting an attack. By adding a cryptographically random additional value to your hash, the hacker needs to compute the secret value with the additional salt, which can make such an offline attack infeasible. You add a salt to a hash by choosing a random value and adding it to the value to be hashed. The combined value is hashed, and often the salt is then stored in plain text along with the hash value. If the hashed value needs to be compared with input (for instance to check a password), the input to be verified is combined once again with the salt and then the hash is compared to the stored hash. Nonce: A nonce is a one-time use random value. Typically, a nonce is used to modify the challenge or response in an authentication system to make it more difficult to break. Signature: A digital signature combines public-key cryptography with a cryptographic hash. A digital signature ensures that a signature is provably from the holder and that the data that was signed has not been changed in any way. The plain text is hashed and that hash is then encrypted with the private key of the signer. Anyone who wants to verify the signature can decrypt the hash with the author’s public key, perform their hash of the plain text, and compare the hash. If they are the same, the content has not changed. Only the author’s public key can be used to decrypt the hash encrypted by the author’s private key. Protocols: A protocol defines the set of rules for using different cryptographic building blocks. IPSec, SSL, and Kerberos all describe how to use the other building blocks to provide a cryptographic function. IPSec and SSL are network encryption protocols, Kerberos performs authentication, and EFS encrypts parts of the file system on Windows. Custom authentication mechanisms, as discussed in Broken Authentication and Session Management threat, are also protocols. Creating new protocols requires a complete understanding of the cryptographic building blocks as well as how to successfully assemble them. Attacking the building blocks themselves is very difficult; most cryptography failures result from a weak protocol created by an unknowledgeable developer. How much data can one key unlock? You generated a key that is 20 characters long and is stored in DPAPI. Your application has been running for ten years, and your original key is still in use. If some of your data was compromised and someone finally decrypts the data and determines the key, how much data have you lost? Did you lose the data that was originally compromised? Or did you lose the originally compromised data as well as all other data encrypted with the same password for the last ten years? Which of the following may result in cryptographic weakness? Some threats are caused by a failure to restrict URL access from unauthorized users. This is a subset threat caused by insecure direct object references. Your application should perform authorization holistically, checking at the beginning of each request to ensure that the client is authorized to access the resource. The following animation illustrates the failure to restrict URL access threat. While many software products include URL access policies and integrated controls, as a general rule, do not write code that circumvents these controls. Which of the following depicts the typical impact of failure to restrict URL Access? Insufficient transport layer protection occurs when SSL or another transport layer security protocol is not used to encrypt vulnerable data. You should always use SSL to protect a session ID or an authentication token in an authentication system. A session ID tells the server that the client is authenticated, providing a set of credentials for a specific period. If SSL is not used, a malicious user can simply sniff vulnerable session IDs and use them to impersonate the victim. Another common issue with this threat is bad SSL certificates, which causes a client to become accustomed to saying “yes” to certificate error warnings to use a vulnerable site. This threat can result in a downgrade attack, which allows a malicious user to place himself between a victim and a vulnerable web site. The malicious user performs a man-in-the-middle attack, where he is able to convince both the server and the client victim that only weak encryption is supported. After this weak encryption is negotiated, the malicious users can brute-force decrypt the encrypted transport session and get access to the plain text. You can prevent this attack by using strong algorithms. Encrypting the connection from your client may not be sufficient. For instance, a rogue administrator at a hosting provider could steal credit card details from the network if your database connection is not encrypted. Use SSL, IPSec, or another transport layer security protocol to protect the connections between the physical tiers of your application. You enable SSL or IPSEC. You set the secure flag on session ID cookies or authentication token cookies. Additionally, when any important information is sent over the wire, use IPSec or SSL to encrypt the information. You avoid mixed SSL, which is content on a single page that comes from both SSL and non-SSL sources. You use SSL or IPSec for communication to the data tier as well. You use extended validation certificates. Strong algorithms are supported; reject weak ones. 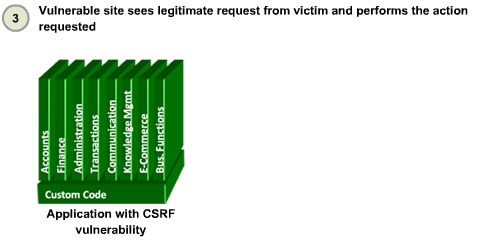 Cross-site request forgery (CSRF), occurs when an action performed by a Web application on behalf of a user does not protect itself from forged requests. If a malicious user can forge a request, and convince a victim to send the request, the malicious user can perform any action the victim is authorized for. Because many intranets support a single sign-on environment where authentication to a site can be performed transparently, the victim need not even use the application prior to being tricked into sending the forged request. Even if the victim is not authenticated and the application does not integrate with a single sign-on system, many authentication systems will intercept a request, require authentication, and then transparently transfer a client back to the original requested location. Because of this, even unauthenticated victims are subject to such attacks. To the vulnerable web site, there is no way to determine that the request is from a malicious user or the victim. If the victim can perform an action, so can the malicious user. Let’s see an example to understand CSRF. A malicious user lures a victim to read some malicious content (in a web site or e-mail). A malicious request is automatically sent to the vulnerable site (in an IMG tag or something similar), or the user might actually click or submit something to initiate the request. 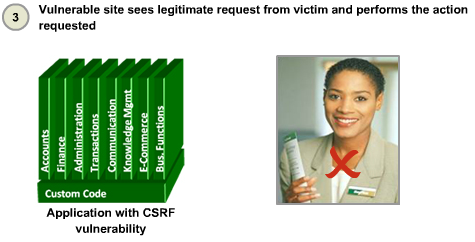 If the conditions are right, the malicious request includes the victim’s credentials when sent to the vulnerable site. If it works, the unauthorized transaction is accepted or returns sensitive data to the malicious user. Regardless of the success or failure of the attack, the attack is invisible to the potential victim. The primary technique to protect against CSRF attacks is to share a secret with the client. To forge a client request, the attacker needs to guess or predict the shared secret. If you use a cryptographically strong secret, it is virtually impossible to guess. Click each tab to see options for a cryptographically strong secret. Nonce: A nonce is a one-time cryptographically random token that is returned to the client. For each request, a different nonce is created, so secrets are not reused. The nonce is sent to the client, and also saved on the server, and then compared when the operation request comes in. The downside of a nonce is that it needs to be stored on the server. If it’s stored in memory, it limits system scalability across multiple web or application servers. HMAC: An HMAC is an encrypted hash or “keyed hash” of the page combined with the session ID. If you create an HMAC of the Page URL, plus the User ID or Session ID a comparison value can be created that will make distributed attacks very difficult. The downside is that every time the user returns to the page it is possible that the same page URL and user ID might be generated, making it possible to steal the secret and reuse it. So you should add a timestamp to the HMAC to ensure the secret value is unique for each request. The timestamp would be concatenated with the page URL and user ID. Like a salt, the timestamp plain text need not be kept secret or protected, and is most easily sent to the client in a hidden form field or placed in a state cookie. During the request, the timestamp is retrieved and added to the URL and ID to generate the comparison HMAC. Do not use GET parameters. Although it’s possible to perform CSRF attacks via POST parameters, it limits the types of manipulation a malicious user can perform on the victim to forge the request. Send successful logins to a well-known location instead of automatic redirection. Do not resubmit POST parameters if you need to perform redirection. Which of the following are the results of cross-site request forgery? The Foundation came online on December 1st 2001 it was established as a not-for-profit charitable organization in the United States on April 21, 2004 to ensure the ongoing availability and support for our work at OWASP. 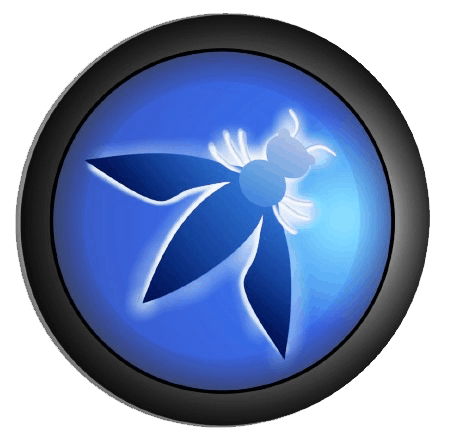 OWASP is an international organization and the OWASP Foundation supports efforts around the world. OWASP is an open community dedicated to enabling organizations to conceive, develop, acquire, operate, and maintain applications that can be trusted. All of the tools, documents, forums, and chapters are free and open to anyone interested in improving application security. We advocate approaching application security as a people, process, and technology problem because the most effective approaches to application security include improvements in all of these areas. We can be found at www.owasp.org. OWASP is a new kind of organization. Our freedom from commercial pressures allows us to provide unbiased, practical, cost-effective information about application security. OWASP is not affiliated with any technology company, although we support the informed use of commercial security technology. Similar to many open-source software projects, OWASP produces many types of materials in a collaborative and open way. The Foundation is a not-for-profit entity that ensures the project’s long-term success. ← The Fallacy of Despair: Why your security breach is not inevitable!